I love snapi ,I use it for everything instead of a serving spoon. I also bought them for gifts they make a great stocking stuffer. The Single Handed Server is great. I've only had them for a short time, but they're used a lot. 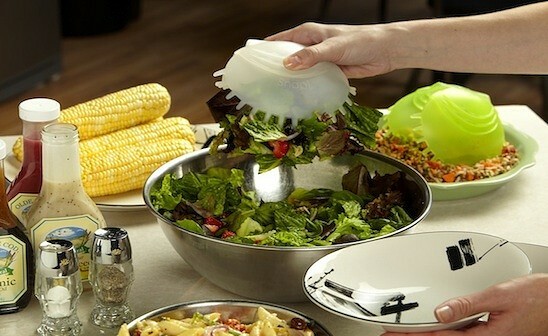 So handy when one hand is full and you need salad on you plate too. I'm really pleased with them - only one problem - one of the lock springs was broken when it arrived. Used with cooked noodles, with salad, with steamed veggies. Gave one as a gift and the recipient was thrilled, too ! 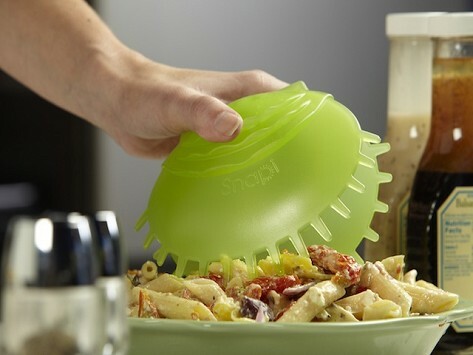 Great Product at a great price, I used mine within a week of getting getting it.Makes serving pasta and salad easier and more fun. I really like the snapi – I have two of them, and gave one to a friend, who admired it at a party. It is easy to put in a salad when I take it to a potluck. Doing it the old way was a bit bulky, but doing it this way I can cover the whole salad, with the snapi inside – and everything is very easy! This is a handy gadget. Even though I, of course, looked at the pictures, it is a little larger than I expected. That's okay though. It works well and a lot of "stuff" can be grabbed at one time. Great product- so simple and quick to serve salad now! I gave these orders of Snapi as gifts because I know how useful they are. I have not yet heard from the recipients, but I'm sure they are enjoying them. even my grandchildren like these. It helped to get them to eat salad! I also use them for other things, like grabbing dog food and noodles out of hot water (I bought more than one, obviously). I gave some to my daughter and her mother-in-law. We all love them!